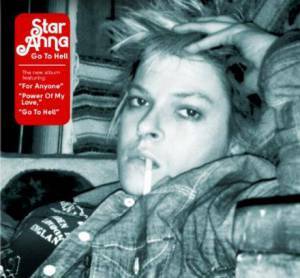 From Seattle, WA comes singer/songwriter Star Anna with her latest release entitled "Got To Hell" on Spark & Shine Records. She has received praise for her music from fellow musicians including Pearl Jam's Mike McCready and Guns 'n' Roses/Velvet Revolver's Duff McKagan. This, her fourth album, continues the path to underground success that lays ahead for Star Anna. The album starts off with the aggressive, acoustic-folk of "For Anyone" as Star Anna has a chip on her shoulder that needs to be unleashed. Star gets a little bluesy on the title song, before hitting her pop stride on "Electric Lights." The edgier side of her sound rears its head on "Let Me Be" as she sings with a purpose. The album also contains a couple of covers including her reckless vocal delivery on "Power of My Love," made famous by Elvis Presley and Tom Waits' "Come On Up To The House," which sounds like a very successful jam session. The album closes with the punk fury of "Smoke Signals." Star Anna has a CD release show lined up for this Friday at The Tractor Tarvern in Seattle, WA. To find out more about this indie folk-rock artist, please visit her website at staranna.com.